The latest U.S. house price data released yesterday for September shows U.S. house price inflation momentum has continued to soar to an annualised rate of more than 13% well beyond the expectations of even the few bullish market commentators at the start of the year, whilst the bears are left to wallow in a state of perma-tripe that continues to go completely contrary to what has actually been transpiring during 2013. U.S. house prices continue to soar to a momentum rate that is significantly beyond my trend trajectory for US house prices to target a trend of 10% per annum, with longer term expectations for US house prices to rise by at least 30% by early 2016. What are the Implications if Momentum Going into 2014? I would not be surprised if current strong momentum is sustained into data for February 2014 to be released in April 2014. Therefore U.S. house prices could be rising at an annualised rate of more than 16% per annum! However, such momentum would NOT be sustainable and WOULD give way to a correction to an inflation rate of under 10% and I would not be surprised if it falls to 7% by July 2014 data to be released in September 2014. So, my expectations are now for a continuing strong rally into April 2014, to be followed by a sharp slowdown in price rises as U.S. house prices consolidate for the remainder of the year, which I am sure will be taken by many perma-bear clueless commentators to imply that the housing boom is over when in reality it would just be the US housing market unwinding from an very overbought state in preparation for their next leg higher that targets a rise of at least 30% by early 2016. So whilst US house prices may be currently soaring well beyond my expectations of Jan 2013. However, when compared against expectations of far more prominent market commentators such as Peter Schiff of just a few months ago, who's expectations were literally for a CRASH, the US housing market is literally galloping up a mountain of worry. U.S. house prices now stand 13% higher on the published data (Feb 2013) at the time of Peter Schiff's article, and therefore US house prices would need to fall by 13% just for Peter Schiff to break even on his US housing market expectations. Though off course when U.S. house prices do eventually correct, then such 'technicalities' will be ignored by the mainstream financial media, as is usually the case. So what is it that the likes of Peter Schiff are missing ? After all it is very easy to construct a bearish argument, I can do it very well, perhaps even better than most of the perma-bears, such as drawing on the the prospects for rising interest rates, after all U.S. treasury yields have been steadily rising for a while which has been picked up the perma-clueless crowd as a signal for a housing market CRASH that is just NOT going to happen! I mean the rate of inflation is not even going to slow for another 6 months, never mind actual FALLING house prices! What many remain blind to is the fundamental driver that has remained constant for the PAST 5 years for stocks which is the exponential inflation mega-trend, the primary consequences of money printing debt monetization programmes that all governments are engaged in an attempt to buy votes through deficit spending, which feeds the exponential inflation mega-trend, which even manifests itself in the highly doctored official CPI data that under reports the real rate of inflation that people actual experience. So whilst the current U.S. CPI stands at a highly beguilingly mild 1.2%, however this STILL resolves in an EXPONENTIAL Inflation Mega-trend. As I pointed out near 4 years ago in the Inflation Mega-trend ebook (FREE DOWNLOAD), governments only have one answer which is to PRINT MONEY! No matter what names it goes by, be it called QE, or government bonds, it is all money printing that results in Inflation against which asset prices are leveraged and oscillate around. Ensure you remain subscribed to my always free newsletter for ongoing in-depth analysis, detailed trend forecasts, and strategies attempting to protect from and capitalise on the exponential Inflation mega-trend. 28 Nov 13, 14:43 housing bubbles? Two headlines I see this morning are BOE governor denies housing market bubble and ex FED chairman Greenspan denies stock bubble. Deflation anyone? Iam sure this money printing thing will fly all the way to the crash site! Yes, they deny the bubbles they created Game of Thrones style. Deflation propaganda suits them well, which apparently so many are still so eager to swallow. When the first QE program commenced in the US (late 2008) commodity prices and stock prices both bottomed. Professional investors/traders obviously believed that the creation of such large sums of money through bond buying and mortgage backed security buying was going to result in a jump in inflation. Equities and commodity prices began to rocket higher as hedge funds jumped in on the long side. As the initial QE 1 came to an end, the Fed announced phase 2; more commodity and equity buying occurred, pushing prices higher still. However, after QE 2 wound down, despite further programs of QE 3, Operation Twist, and then QE 4, most commodities have moved lower. In contrast, the equity markets have continued to ascend (as you have correctly predicted) and more recently so has the housing market (also correctly predicted by you). The newly printed money seems to have primarily gone into the hands of forces which have targeted equities (and now housing). In other words, while these QE programs have not (yet) resulted in the widespread outbreak of inflation that perhaps market participants originally expected them to produce during rounds 1 and 2, they have indeed produced a massive wave of inflation in the equity (and now housing) markets. Also, during the run up in commodity prices during QE 1 and 2, some producers/growers, etc... have responded to the higher prices by ramping up supply. As there is always a time lag between the rise in price and the subsequent increase in supply, we are now seeing this (the US have a record corn crop this year and a very large bean crop – same for South America). As I see it, there are now two forces that are working against rises in commodity prices (in general). Some increases in supply resulting from higher prices a couple of years ago combined with an outflow of speculative money in search of yield in this near zero interest rate environment. 1. Do you see any other reasons why there has been a general wave of deflationary pressure in the commodity space and, accounting for specific supply increases, why do you think commodities have suffered so much while equities (and now housing) have exploded? Why hasn’t more recent QE provided a base of strong support for commodities? 2. Your Inflation Megatrend E-books have always spoken about leveraging oneself to the equities and commodity markets (including blue-chip mining shares like RIO and BLT), therefore I assume you expect a return to stronger commodity prices? When do you think this might be and what do you think the catalyst will be? 3. You have also reiterated in the past that the further the equities market is away from the previous bull market highs the greater the buying opportunity. With commodities now much further from their bull market highs than equities, and leaving the housing market to one side for the moment, do you think there is better value investing in either commodity ETFs or shares of companies involved in the commodity sector? 4. Would I be correct in assuming that you expect the economic recovery in both the US and UK to surprise to the upside; that governments/central banks will continue to keep their monetary policies loose, therefore exacerbating inflationary bubbles across a variety of markets? Always enjoy reading your articles and posts. 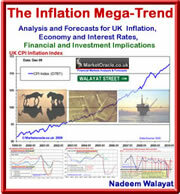 Asset and commodity prices are leveraged to and oscillate around the inflation mega-trend. To see where to weight investmetns one takes into account risk, volatility and where the market is in terms of its oscillation around the inflation trend hence why housing today is one of the best, and commodities one of the least best due to the degree of the previous bull market for which we only look at what has happened to Gold and Silver. My view is this, I accumulate (taking risk into account) when an asset or commodity becomes cheap, where commodities are concerned I most favour oil stocks and then mining companies such as the ones mentioned. To reduce Risk and Stock market investing is VERY HIGH RISK, I always prefer consistently dividend paying and raising stocks, however as BP illustrated this is still high risk. 1. My focus is on dividend paying and raising stocks that I am invested in, I only tend to pay attention to the price its trading at if I am looking to sell or buy, but most of the time I HOLD, for a very, very long time ! Some stocks I am holding for decades. As long as the dividends flow then it's ok, if I want to sell then I time exit on a strong rally. 2. I hold BLT, and I am only interested in a. accumulating if it gets cheaper, and b. that it pays dividends, it is still nearly double where it was 5 years ago and pays over 4% with a dividend growth rate of approx 3%, it is a good long-term investment stock. 3. I prefer individual stocks than ETFs, I only do ETF's where I am new to a sector such as biotech and I just lack the knowledge to identify which stocks I should invest in for probably a decade or more. 4. Economic recovery will surprise all to the upside, I can easily imagine 4% GDP per annum 2 years down the road. Remember there is no deflation only oscillations around the Inflation mega-trend. Gold going up by over 750% whilst inflation over the same period was about 50% illustrates how far sentiment can push a market beyond the Inflation trend but the subsquent price fall is NOT deflation for there to be deflation it would need to fall to a less than its real-terms value, and the price one takes into account is average price accumulated at against current market price, not peaks and troughs.